The Prime Minister of the Lu State, Ji Wenzi, was known for his thriftiness and strict conduct, and was deeply respected by his people. Dizi Gui (Standards for Being a Good Student and Child) is a traditional Chinese classic for children that teaches morals and proper etiquette. The ancients always regarded thrift as one of the most noble virtues in daily life. Tidiness was also considered a reflection of one’s character, and a mark of respect for others. Such exemplars liked Zi Lu, a student of Confucius, and Prime Minister Ji Wenzi would explain why cleanliness and thrift were so important in their lives. 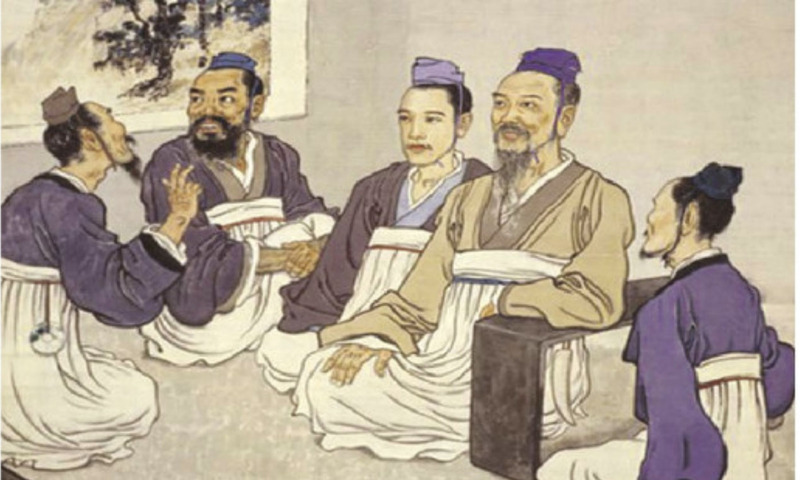 Zi Lu (子路) was a student of Confucius and an official of the State of Wei. Despite his hot temper, he was a very upright person and was very careful about his appearance. One year, the State of Wei erupted in internal chaos as rebels gained power and began conducting raids against those in the state administration. Upon hearing the news, many officials packed and fled overnight. Despite being out of the country during the rebellion, Zi Lu chose to rush back to aid his country. His peers tried to dissuade him from going back, saying that the situation was very dangerous and he would likely be killed if he did. Zi Lu fought against the rebels with all his might, but was far outnumbered. He was eventually injured by the rebels and his hat tassel was cut off. Knowing that death was imminent, Zi Lu roared loudly, “Stop!” Stunned by the loudness of his shout, his attackers stopped. Zi Lu then said, “If I am going to die, I should at least die in a dignified manner!” Calmly, he retied his hat tassel to his hat, and faced his death heroically and with honour. The story of Zi Lu’s inspiring courage in the face of death has been passed down to this day in Chinese history. Prime Minister Ji Wenzi (季文子) was born to a family of three generations of ministers. He was a nobleman and famous diplomat of the State of Lu during the Spring and Autumn Period, serving his country for more than 30 years. Ji Wenzi led a very simple and frugal life. He considered thrift to be the fundamental guiding rule for his conduct, and required his family to be as frugal as him. He dressed very simply but neatly, and besides the formal robes he wore in court, he did not have any other fancy clothes. Whenever he travelled for work, he would use a very plain-looking horse carriage. One of his ministers, Zhongsun Ta, tried to persuade Ji: “You are the highest-ranking official, and command great respect. But I heard that you don’t allow your family to wear silk clothes at home, and you don’t feed your horses with good grain. You also don’t pay attention to the quality of your clothes. Wouldn’t this make you look too shabby, and be a source of ridicule by our neighbouring countries? Ji responded in a serious tone: “I, too, want my home to be decorated luxuriously and elegantly. But look at the people in our country. Many of them are still eating food that is too coarse to swallow, and are wearing clothes that are torn and shabby. There are also others who are cold and starving. After hearing Ji’s words, ZhongSun was ashamed of his previous comments, but also had even more respect for Ji. From then on, Zhongsun also followed Ji’s example in leading a simple life. He asked his family to wear clothes of ordinary cloth, and fed his horses with rough chaff and weeds. When Ji Wenzi learned of Zhongsun’s change, he praised Zhongsun for being a moral person who could amend his mistakes immediately.